Anyone involved with peregrines will be aware of their attitude towards larger Birds of Prey, especially near their nest sites or within their territory. 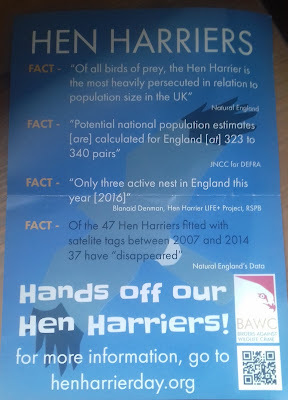 They are exceptionally aggressive towards them; Common Buzzards, Red Kites and Marsh Harriers all get the same treatment it seems, even outside of the breeding season. As far as I am aware from observations in London, they ignore Sparrowhawks and Kestrels, both species are slightly smaller, likely not seen as a threat, also both are prey species. Due to their increased density all over the UK, great to see, Common Buzzards come into contact with peregrines far more, from my monitoring it seems the reaction is always the same. There generally ignored but watched, if there too high to go up after, but lower down is a different matter. I was at a site recently when 2 Common Buzzards entered a peregrine territory; both were at a height that was obviously too low, this was born out straight away when a Crow found one of them. The 1st Buzzard lazily thermaled whilst the Crow mobbed it, basically ignoring it and not needing to defend itself, the Crow I suspect is seen as an ‘occupational hazard’, they mob many birds. Shortly after, the Crow gave up after presumably edging the Buzzard out of its territory. The Buzzard unfortunately then drifted into the peregrines territory, the adult Falcon located it, it was having a bad day. Reaction from the Buzzard then changed dramatically as the Falcon repeatedly dived on it and forced it to defend itself by flicking over ‘and presenting talons’. This went on for about 2- 3 minutes with the Buzzard getting lower and lower, unable to thermal and gain height, I eventually lost them to view with the Buzzard very low and still trying to get away. 5 minutes after this I then picked up the 2nd Buzzard, higher but straight away another peregrine had found it, however this time it was a juvenile female. It seems the natural aggression towards larger birds of prey is genetic and inbuilt; this juv female was giving the Buzzard a torrid time. The same tactics were again used, diving, casting back up and then diving again and so on. Quite obviously it looks as if they are trying to hit a wing or the head. Again this attack was sustained and eventually lost to view also. It’s no surprise that at a site in the West Country, Peregrines have accounted for no less than 15 Common Buzzards over the years; it was even featured on the One Show. 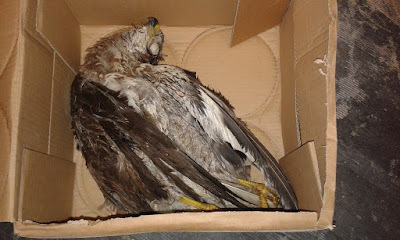 For me, only this year I retrieved the dead Common Buzzard above at a peregrine nest site in London, it met its unfortunate end sadly after getting too close. Once the new glass lift to the top of the North West chimney is in situ, I would imagine the public will not only get incredible views of London, but also of the peregrines floating by. We unfortunately lost one of the juveniles, much the same as in 2016, this is sad but normal and has happened on at least 5 of the sites that I monitor this year, fledging in an urban area is usually always a hazardous business I’m afraid. The remaining 3 are now venturing further afield exploring the adults territory, it’s becoming harder to catch up with them on my visits, however I did get lucky on August 6th with all 3 very active. I had the chance on the above date to try and catch up with the adults and there 3 juveniles, weather was not great it has to be said. All kept their distance but I got a few shots. Now in their 2nd year of breeding at Parliament and in particular on Victoria Tower, they have again fledged 3. There previous nest site in Vauxhall, Keybridge House is being demolished, it may already have gone and is making way for the regeneration of the area, it served them well and produced a respectable 14 juveniles. The nest box on Victoria Tower has been in situ for a number of years but the pair, with an established site on Keybridge at the time ignored the alternative box on Victoria Tower. It was only accepted in 2016 when the Vauxhall nest site was no longer available to them, it was touch and go for a while but in the end it was adopted glad to say. 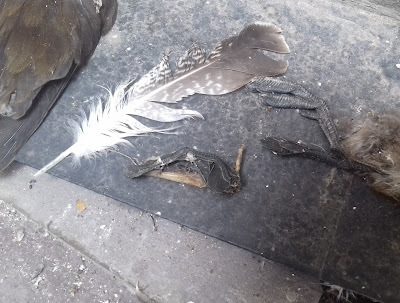 On July 18th we also had a clean out of the balcony and nest box on Victoria Tower, as you would expect from feeding 3 juveniles, there was some interesting prey present. Along with the many feral pigeons, there was also other species of note, these included Goldfinch, not surprisingly Ring Necked Parakeet, Starling, Blackbird and Dunnock. Other interesting prey was also present namely Lapwing, Herring Gull and 2 Little Grebes. The Lapwing was undoubtedly a passing overhead migrant be it night or day; however the Herring Gull feather, one of 6 similar present is very interesting. Having had the feather identified, it is an immature bird, it is unusual prey for a peregrine in London, it is bigger, very aggressive and in short a right handful. It could well have started as territory defence if it flew too close and may have escalated into prey, after attacking and subduing it. Why go for risky prey when there is far more easier alternatives like feral pigeon? I can only see the Falcon as being the only one capable of carrying the Gull, must have been quite a tussle, there is also the possibility of her going up and intercepting it nocturnally. This brings me onto the Little Grebes; these move around at night mostly as they are such weak flyers and would suspect they have been taken nocturnally. 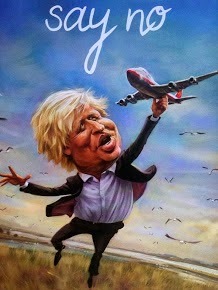 It’s likely they were either moving down the Thames/or they have been predated over nearby St.James Park in the dark. It’s hard to imagine them flying high overhead in the dark but having said that I know Coots/Moorhen do this nocturnally, weak flyers also, I have recorded them as prey often, especially Moorhen, so why not high flying Little Grebes. 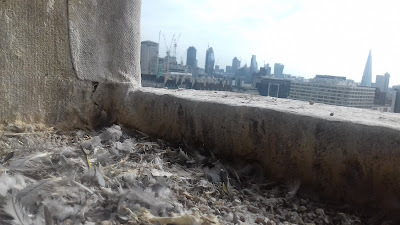 Room with a view - what a peregrine sees. With the artificial light that London throws up and the peregrines incredible eyesight it’s likely that most every London pair is hunting nocturnally, it’s an exploitable food source and testament to the peregrines resilience and adaptability. On July 4th I visited the site to undertake a BBS, even though getting late in the season there was still plenty of breeding activity by a number of species. Waders were much in evidence with freshly arrived Black Tailed Godwits present back from their breeding grounds, most still in their breeding plumage, alongside them were good numbers of Avocets also. The Avocet flock also contained many juveniles, with a rising tide the breach held good numbers of birds at this early stage in the year. Yellow Wagtails seemed to be all over the place with many juveniles, as a breeder on my local patch they now seem to have disappeared entirely. No Raptors were evident as yet, the hoped for camera friendly Hobby on the entrance track failed to materialize. Some photos below from the visit. 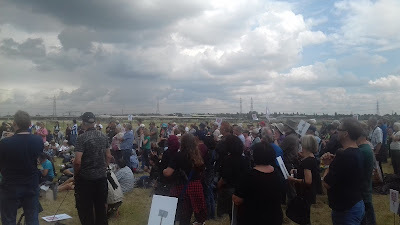 A good turnout of probably over 300 people were present to hear speakers Rob Sheldon, Mark Thomas and Chris Packham getting the message across over the illegal killing of Hen Harriers. Great speeches by all which really got it across as to what is happening to Hen Harriers, the facts below says it all, the persecution of the species has to change, it’s simply not acceptable in this day and age. Good also to catch up with many friends who also supported the event.